At time of writing, City sit top of the Championship – they have won their last five games. Later today, they could potentially be sitting seven points clear of third placed Sheffield United. depending on how their game against second-placed Leeds United goes. This season has been one full of joyous moments, togetherness and a real feeling of positivity. This makes it all the more surprising that, this week, Carrow Road became a place where a minority displayed their discontent towards someone donning a jersey with the yellow Canary emblazoned upon their chest. Football is a game of opinions, some possess more substance than others, but that doesn’t discredit any. That’s the right of any football supporter and, by design, this isn’t an article which will bemoan supporters or question why Tim Krul received the response he did after his mistake but will instead reflect upon the role supporters have to play. Stuart Webber has mentioned on numerous occasions the importance of marginal gains. Football is not alone in this – even in sports who meticulously study every inch of performance, like Formula One, marginal gains are a vital component to success. Sadly, in the aforementioned example, they don’t possess the fan dynamic available in football. Plenty is made in the current climate questioning around how much impact creating an atmosphere and a vibrant environment inside a ground translates to performances. Does singing louder result in the players running more? Does it make them feel taller? Carrow Road is resplendent right now. Gone are the days of it an atmospheric void where hearing any degree of sound from the terrace was a shock to the system. Draped in flags, colourful and loud, the ground has been transformed. The work of Along Come Norwich and the Barclay End Norwich is there for all to see. Creating a footballing theatre is important, and if you happen to have seen German games or witnessed the colour, emotion and passion of clubs overseas, you begin to recognise that for many years the English game has been operating in an alternative universe. Instead, English football is generally an environment full of expectation and media scrutiny, one that has been created for the supporters but not by the supporters. And let’s be frank, it’s simpler to opt against making noise, being passive and submissive to the surroundings. Again, how individuals wish to watch football is a matter for them. For clarity, whether you wish to sing yourself hoarse or wish to watch the match in calmer surroundings – like myself – is a purely individual choice. There is no correct way to watch football or to be a fan, but each of the 27,000 packed inside Carrow Road have a collective responsibility. And there is no denying that those difference in viewing preferences mean that creating a vibrant atmosphere will always pose challenges. But that vibrant atmosphere is so vital especially when it’s one that even permits players to make mistakes, some of which may result in conceding goals, and is sometimes even more pivotal than having the crowd sing itself hoarse. However, if you can bring together both of those elements – a positive atmosphere and an understanding environment – then you have a place where footballers can operate consistently. Simply because a player is older, has played more games than most or has made mistakes previously, doesn’t mean he is fair game for heckling or slander. Reference the case study of the Murphy twins – they received, fairly and unfairly, rightly and wrongly, differing scales of put downs and critiques. But if they had operated in an environment where their flaws were accepted, where their personalities were recognised and respected, then that could have constructed an environment in which they improved beyond their current ceiling. Experienced players don’t warrant that reaction where every mistake results in an intense vilification. Debate, analysis and critique of players is acceptable – that’s football and is why we love it – but the manner in which its conducted needs to improve. If criticism is noticeable to those in the boardroom who have been asking for patience and understanding and by those donning the yellow and green, then quite simply it’s unhelpful. It needs evolving. This group is a broad church, dynamic and relatable, but they require an understanding environment when they operate, or you risk affecting their ability to express themselves. Subconsciously that will alter whether a player opts to pick the risky or simple pass. Or whether the goalkeeper opts to go long or show courage to play out and allow Norwich to play Farke-ball, as opposed to resorting to the simple option. This is a side constructed on risk-taking, it’s a pivotal part of their off and on field approach. It takes a while to create an environment but only a second to deconstruct it. The marginal gains around singing with gusto are obvious but that positive environment, opting to clap over jeer, support over criticise and believe over belittling are a big part of what has taken us this far. And name me a team that warrants that sort of environment more than this current one. The vibrancy, talent and fearlessness with which they operate is integral to why they sit top of the tree. That’s something supporters should cherish and seek to ignite, not to demolish. Should this side reach the Premier League, this environment could be the difference between one point and three. The same goes for the current situation. Five games at Carrow Road could see City cross the finish line – the difference in one of those fixtures could be a player opting for the difficult route compared to the easy one. Carrow Road should resemble this team: unstoppable, unflappable while rolling with the punches. Let’s create an atmosphere for our players to display their talent and put their finest foot forward not one which creates unnecessary self-doubt. Excellent article Connor and WHY do a handful of fans feel they have the right to moan/criticise/harass a player just because they’ve made a mistake??? Krul has saved us MANY more points than he has cost us – those two saves at the end of the game at the Den come immediately to mind. Aarons’ slip resulted in the opening goal for Forest, but Klose immediately put his arm around him and he was brilliant for the remainder of the match. Both SW and DF have praised Krul’s contribution to our lofty league position and IMO, if fans want to moan, better that they just remain silent. As you rightly say, we are on the cusp of something unbelievable and the team need as many fans as possible singing/chanting their support. Great piece Connor, much has been made of the one mistake, it would make a canary utside to think Krul, cost the whole three points, got us knocked off the top of the table and plunged us in to the play-offs. I said in comment on Mr P post, he has got us more points by blinding saves that he has lost. Thime to move on and put it in the past. 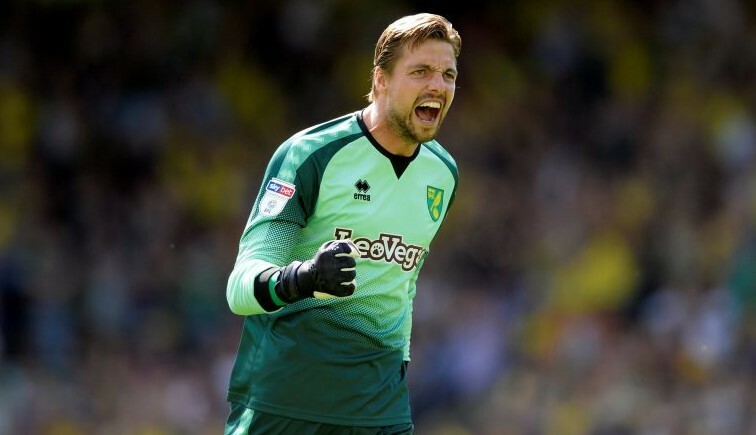 Tim Krul is more than a half decent keeper, we would have biten anyones hands off to have a few years ago, he is on his way back over 18 months out is a huge bearing on any player especially one who is under the spotlight more than most. I completely agree. I’ve never understood the mentality of being negative during the game. I found it very frustrating having to listen to it all last year when clearly we were trying to establish a new style of play. As for doing it while we’re top & on a great run defies belief. I have read thousands of articles relating to my/our beloved Norwich Coty over my 54 years and for the first time would just like to reply to you and say well said sir!! We need only look to ourselves, if we do the business anything else is immaterial. Who is moaning? Criticism of mistakes are inevitable. Nerves are stretched further by needless stress. 5 wins in a row is brilliant, yet even with that we are not pulling away, which is where the pressure is coming from. Webber’s defence of Krull is OTT…”best signing we have made”…but he feels the need to protect. One for all, and all for one…understandable. I am more confident in points on the road, as i have been all season. Support at Carra’ is great just now, and it will continue that way as long as it is deserved. Football fans thrive on unnecessary self doubt…it magnifies the highs when they come around and is of course based on experience. Hope rings eternal…Never Mind the Danger! Really cannot understand why some get on the back of one of this brilliant team. We are top of the league – just enjoy it. Looks like our least favourable result as SU beat LU 1-0. Still we could go 5 points clea rof LU in 3rd if we can beat Rotherham. That would be a great position and I just have a feeling that this cold be the beginning of a LU blow-up – not least as Casilla has been sent off,. Krul to be kind has proved he is a good stopper for a number of years and his injuries has effect his confidence yes he has earned city more points than lost and as with many supporters are happy he is our keeper this season. Watching his last two games he has been targeted by the opposition knowing he isn’t completely comfortable with the ball at his feet and when closed down panics to clear the ball up field this will be noticed by watching managers with games against city coming up. Today at Rotherham with their injury list I don’t think it will a problem but against Middlesbrough I can see Pulis having plans to really have a go at this perceived weakness. … and Dean Henderson currently on load at SU form Manure. Regards TK I believe in the minds of the few any keeper other than Angus was going to have a hard time , Angus made an error and his song would be sung, TK is suffering because he’s not Angus. There are also negative souls among us who get off on moaning and are out of life’s comfort zone when things go really well. They are only happy when they have a reason to moan. We are witnessing the best of times and the entire squad are magnificent. No such thing as constructive criticism just explaining how things can perhaps be improved. If anyone hears a fan jeer one of our players tell ‘em to Vincent Van Gogh. Perceptive article Connor, but not all readers will get it. Modern managers from all spheres of operation understand that people have to be empowered to make mistakes. If you can’t make mistakes, you won’t learn, you won’t improve. Supporters have the right to howl at errors – just as the players will do, themselves – but they have to put a supportive metaphorical arm around those players because a) it’s the right thing to do, and, b) we want this brilliant football to continue. Also, can the Norwich flags in half the Barclay end not be spread across the entire stadium to all stands, creating a visual backdrop to celebrate the stunning football we are witnessing. That would both inspire the players more, give our hope ground a fortress Germanic-style identify – exactly the kind of marginal gain Webber et al may want to embrace, especially during the critical run-in?